Jñanasutra (Skt. 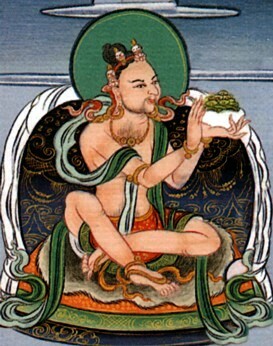 Jñānasūtra; Tib. ཡེ་ཤེས་མདོ་, Wyl. ye shes mdo) — one of the early masters of the Dzogchen lineage. He was a disciple of Shri Singha and the main teacher of Vimalamitra. His last testament, which he conferred upon Vimalamitra before passing into the rainbow body, is called the Four Means of Abiding. Nyoshul Khenpo, A Marvelous Garland of Rare Gems: Biographies of Masters of Awareness in the Dzogchen Lineage (Junction City: Padma Publications, 2005), pages 40-41. Tulku Thondup, Masters of Meditation and Miracles, edited by Harold Talbott (Boston: Shambhala, 1996), pages 65-67. This page was last edited on 20 November 2017, at 09:11.